Despite Battlefield Hardline coming out just one year after Battlefield 4, the series hasn’t been turned into an annualized one–which is to say, EA doesn’t plan on releasing one every year, a la Call of Duty. This is according to EA Studios executive vice president Patrick Söderlund, who stated in an interview with Polygon that Hardline is not setting a precedent for the franchise’s future release schedule. “It doesn’t necessarily mean that we need to annualize Battlefield and that’s the way it’s going to be forever and ever,” he said. “I understand that some people may look at it that way but that’s what happened. These comments come shortly after telling Polygon that not every game EA makes will get a sequel the following year or sell upwards of 10 million units. “The EA that I’m trying to help build isn’t an EA that needs to annualize everything,” he said. Deployable ziplines are now a thing. EA does have some annualized series–namely its sports games, like Madden and FIFA–but, for as criticized as the publisher is, it has so far avoided bringing out its primary Call of Duty competitor, Battlefield, every year. Battlefield games have come out in successive years before–Battlefield Vietnam launched in 2004 and Battlefield 2 came out in 2005, while Bad Company 2 released in 2010 and Battlefield 3 followed in 2011–but just as often they have not. Despite the flak it’s gotten for its buggy launch, Battlefield 4 came out two years after Battlefield 3 (though many would say that still wasn’t enough time, given the state it was released in). 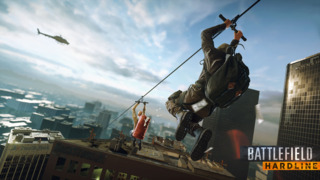 Even though it’s being developed by a different studio–Hardline is being made by former Dead Space developer Visceral Studios, whereas Battlefield has traditionally been developed by DICE–some fans have complained about a new Battlefield game coming so soon after Battlefield 4, which is still far from perfect. Improvements continue to be made to that game, particularly to its netcode–and these improvements will be implemented in Hardline to ensure it plays more smoothly than its predecessor did at launch. A beta for Hardline is currently taking place on PC and PlayStation 4, something which the developers say will help the final product. Meanwhile, DICE general manager Karl-Magnus Troedsson stated recently that discussions have taken place about making use of ‘early access’-style releases to help improve the studio’s future games. Battlefield Hardline was announced last month after its existence was leaked ahead of E3. The cops-versus-robbers shooter will be out on October 21 for PC, Xbox One, PlayStation 4, Xbox 360, and PlayStation 3. For more, check out our E3 preview recapping everything we know about the game. How Does Battlefield: Hardline’s Hotwire Mode Play? Tagged After, Annualized, Battlefield, been, Coming, Despite, Hardline, Preview, Year, “hasn’t.